These days, you don’t even have to leave your house to experience a great trip. You can decide when and where to use your magic mushrooms, because you’ll be growing them yourself! Buying and selling magic mushrooms is illegal, but it is completely legal to order a medium mushroom grow kit from Avalon. The medium mushroom grow kits have a volume of 1200cc (1200 ml) and are available with different types of shrooms. The growing method for most of these types is similar, but the effects of the shrooms can vary wildly! If you have just started growing (and using), you might not know exactly what to expect. The most popular magic mushroom type (especially for beginners) is the Mexican one. These create a lot of visual effects during a trip that is full of energy and enjoyable. The effects of the fairly accessible Thai shrooms are actually quite similar to those of the Mexican type. If you are looking for a type that is a bit stronger, you could try the Colombian type. These can yield a rather intense sensory experience. McKennaii: this shroom type, named after the American psychonaut, philosopher, and mystic Terence McKenna, creates an intense mind trip. Growing shrooms can be quite the challenge. Professional growers sometimes have to work at it for months. Lucky for you, it is possible to do it faster than that! With the medium mushroom grow kits in our selection, you can have the perfect mushrooms after just a few weeks. Read the requirements before using them, so that you can be sure that you are taking advantage of all your options. The medium mushroom grow kits yield several hundred grams of fresh shrooms. You only need about ten grams for a good trip, so you’ll have plenty left over! You can store fresh shrooms for several days in the refrigerator or dry them out and keep in a dark, dry place for several months. 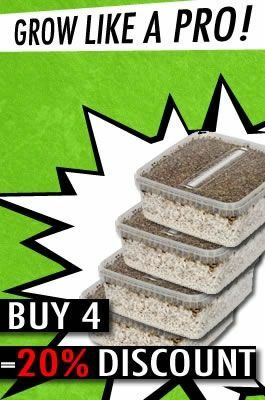 Do you have questions about our shroom grow kits or other products in our selection? Please contact us!